Singapore is well-known as a clean and green city with the government striving for environmental sustainability while growing the economy. The government has also identified Environmental and Water Technologies including Clean Energy as strategic areas where Singapore has a competitive edge and which could generate future economic growth. 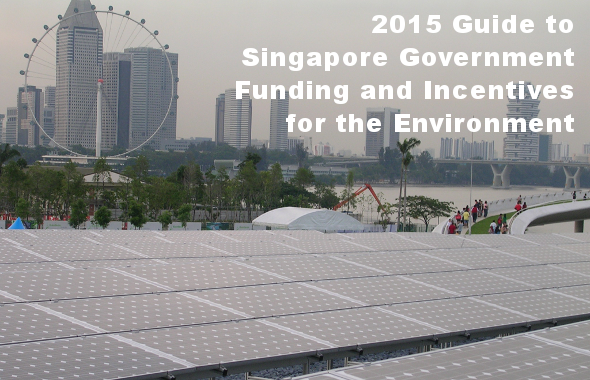 To accelerate the growth of the environmental industry and to maintain Singapore’s image as a City in a Garden, the government has initiated several funding and incentive schemes related to energy efficiency and clean energy, green buildings and construction, water and environmental technologies, green transport and shipping, waste minimisation, environmental initiatives, and capability development. If we missed out any funding or incentive scheme, do let us know. Thanks! NEA provides a co-funding scheme called the Energy Efficiency Improvement Assistance Scheme (EASe), to help companies in the manufacturing and building sectors engage accredited Energy Services Companies (ESCOs) to conduct energy audits and identify potential areas for energy efficiency improvements. Funding is provided up to 50% of the qualifying costs of engaging an ESCO and capped at $200,000 for a single facility or building over a five-year period. The Grant for Energy Efficient Technologies (GREET) by NEA and EDB provides funding for the Singapore-registered owner or operator of existing or proposed industrial facilities to invest in energy efficient equipment or technologies. Funding is provided up to 20% of the qualifying costs and capped at $4 million per project. The applicant must also be a partner under the Energy Efficiency National Partnership programme and have implemented an energy management system. The One-Year Accelerated Depreciation Allowance for Energy Efficient Equipment and Technology (ADAS) tax incentive scheme by NEA encourages companies to replace old inefficient equipment and invest in energy saving equipment. The capital expenditure on the qualifying energy efficient equipment can be written off in one year instead of three. The Design for Efficiency Scheme (DfE) by NEA aims to encourage new facilities or facility expansion projects to integrate energy and resource efficiency improvements into their development plans early in the design stage. Funding is provided up to 50% of the qualifying costs or $600,000, whichever is lower. The Singapore Certified Energy Manager (SCEM) Programme offers training and certification in energy management, and is for engineering professionals to develop the technical skills and competence to become the Energy Managers of their organisations. The SCEM Training Grant is a co-funding scheme by e2i to fund up to 70% of the training cost at the Professional Level SCEM Programme. The iSPRINT funding by IDA can be used for SMEs to implement an Energy Monitoring System to monitor and take control of their energy consumption. Funding is up to 70% of qualifying costs and capped at $20,000. This comes under the SME Energy Efficiency Initiative, which is developed by SPRING Singapore and led by the Sustainable Energy Association of Singapore (SEAS). The Energy Innovation Research Programme (EIRP) by the Energy Innovation Programme Office (EIPO), provides research grants to develop the clean energy sector in Singapore. The grant calls are open to Institute of Higher Learning, research institutes, public sector agencies, not-for-profit organisations and private sector companies. The Clean Development Mechanism (CDM) Documentation Grant by NEA encourages companies to develop CDM projects in Singapore. Funding is provided up to 50% of the qualifying cost of engaging a carbon consultant to develop a new methodology and Project Design Document (PDD), or only up to 30% if the carbon consultant develops a PDD using an existing approved methodology. The maximum amount of funding for a CDM project is capped at $100,000. The Building Retrofit Energy Efficiency Financing (BREEF) Scheme by BCA in collaboration with participating Financial Institutions (FIs), is a financing programme to provide credit facilities for non-residential building owners, Management Corporation for residential and non-residential buildings, Energy Services Companies, or Energy Performance Contracting firms, to carry out energy efficiency retrofits of existing commercial buildings, which will lead to the building achieving minimum Green Mark certified standard. The maximum loan quantum per loan is up to S$5 million and the interest rate is decided by the FI. The maximum loan tenure is up to 8 years. A $100 million Green Mark Incentive Scheme for Existing Buildings (GMIS-EB) was set up by BCA to encourage developers and building owners of existing buildings to undertake improvements in energy efficiency. The scheme provides a Health Check scheme, which is an energy audit to determine the efficiency of the air-conditioning plants. BCA will co-fund 50% of the cost and the remaining 50% is borne by the building owner. The Green Mark Incentive Scheme – Design Prototype (GMIS – DP) by BCA is to encourage developers and building owners to focus on energy efficiency in buildings right at the design stage. The scheme provides funding for the engagement of Environmentally Sustainable Design (ESD) consultants to conduct collaborative design workshops and assist in simulation studies early in the project. The Green Mark Gross Floor Area Incentive Scheme (GM-GFA) by BCA and URA is to encourage the private sector to develop buildings that attain the higher Green Mark ratings. URA will grant additional floor area over and above the Master Plan Gross Plot Ratio (GPR) control, up to 1% for Green Mark Gold Plus developments and up to 2% for Green Mark Platinum developments, and subject to a cap of 2,500 sqm for Gold Plus and 5,000 sqm for Platinum. The Green Mark Incentive Scheme for Existing Buildings and Premises (GMIS-EBP) by BCA aims to encourage building owners and tenants to undertake energy improvement works involving the installation of energy efficient equipment. The scheme is targeted mainly at (a) existing private commercial buildings such as shopping malls, hotels, office buildings and other approved buildings and (b) tenanted premises such as offices, retail, restaurant and supermarkets. It provides a cash incentive up to 50% of the qualifying costs. The MND Research Fund for the Built Environment is a $50 million funding initiative by the Ministry of National Development (MND) and managed by BCA. The objective of the fund is to encourage and support applied R&D that will raise the quality of life and make Singapore a distinctive global city. The fund covers 30% to 75% of the qualifying cost of the project, subject to a cap of $2 million. The A*STAR-MND Joint Grant Call for Green Building R&D launched by BCA, A*STAR and MND is a call for proposals in green building technologies. This is open to researchers in all local public sector research organisations and private companies. Each project should have at least one industry partner as its co-investigator to encourage R&D collaboration between research organisations and private companies. The Skyrise Greenery Incentive Scheme (SGIS) by NParks is to encourage the installation of skyrise greenery on existing residential and non-residential buildings in Singapore. Funding is provided up to 50% of the cost of installation of green roofs and vertical greenery. The Sustainable Construction Capability Development Fund (SC Fund) by BCA is a $15 million fund for developing capabilities of the building industry in adopting sustainable construction methods and materials. The SC Fund will focus on recycling of waste from the demolition of buildings and the use of recycled materials for construction. Funding is up to 50% of the total qualifying cost, depending on the type of application and the merits of the project. The Quieter Construction Fund (QCF) by NEA is a funding scheme to support Singapore-registered companies in adopting the use of quieter construction machines, noise control equipment and innovative solutions to reduce the impact of construction noise on sensitive premises to achieve a quieter living environment. For an applicant who is operating on a construction site, the total funding is capped at $100,000, or 5% of the project contract value, whichever is lower. For an applicant who is a supplier of construction equipment, it is capped at $100,000, over 2 years. The Water Efficiency Fund (WEF) by PUB encourages companies to be more efficient in managing their water demand or promote water conservation in the community. For feasibility studies, PUB will co-fund 50% of the study cost. For water audits, PUB will co-fund 90% of the water audit cost. For community campaigns and programmes, PUB will co-fund 50% of organising the programme. Funding is also available for water recycling efforts and use of alternative source of water. The Fast-Track Environmental and Water Technologies Incubator Scheme (Fast-Tech) is an initiative by the Environmental and Water Industry Development Council (EWI). The Fast-Tech scheme aims to grow environmental and water start-ups by providing financial incentives and mentoring by specialized incubators. Funding is provided up to $500,000 per project or up to 85% of qualifying costs, over two years. The TechPioneer Scheme by the Environmental and Water Industry Development Council (EWI) aims to accelerate the commercialization of new environment and water technologies by bringing together both technology vendors and users to apply jointly under this scheme. Funding is provided up to 70% of total qualifying costs for a technology user for Singapore government adoption projects, and up to 30% for others. The Environment and Water Research Programme (EWRP) managed by the Environmental and Water Industry Development Council (EWI) funds Institutes of Higher Learning, research institutes and Singapore companies to research and develop new environmental and water technologies. EWRP provides grants to support costs arising from the projects such as manpower, training, equipment investment and professional services costs. The Technology Enterprise Commercialisation Scheme (TECS) by SPRING Singapore is a scheme to fund upstream R&D projects in specific technology areas. For projects relating to water technology, Proof of Concept type of projects can be funded up to S$250,000 per project and up to 100% of the qualifying cost. The duration of funding is up to 1 year. The Innovation for Environmental Sustainability (IES) Fund is managed by NEA and helps companies to implement environmental protection and public health related projects. The proposed project should be at the applied research and test-bedding/demonstration stages of technology developments, and helps Singapore meet its goal of environmental sustainability. The IES Fund provides funding to cover some of the qualifying cost of the project, up to a maximum of $2 million and up to a maximum of 3 years. Under the Carbon Emissions-Based Vehicle Scheme (CEVS) by LTA, new cars, taxis and newly imported used cars with low carbon emissions registered from 1 January 2013, will qualify for rebates. This rebate will be given out in the form of an offset against the vehicle’s Additional Registration Fee payable. The Green Technology Programme by MPA encourages local maritime companies engaging in terminal operations, ship owning and/or operations and harbour craft operations, to develop and adopt green technologies. Projects should have verifiable emissions reduction for sulphur oxide, nitric oxide, and carbon dioxide, that comply with industry performance guidelines. Funding is up to 50% of the total qualifying costs and capped at S$2 million per project. The Green Ship Programme by MPA provides incentives to encourage Singapore-flagged ships to reduce carbon dioxide and sulphur oxides (SOx) emissions. Ships that adopt both energy efficient ship designs and approved SOx scrubber technology exceeding IMO’s requirements will enjoy 75% reduction of Initial Registration Fees and 50% rebate on Annual Tonnage Tax. The Green Port Programme by MPA is to encourage ocean-going vessels calling at the Port of Singapore to reduce the emission of pollutants. Under the programme, 25% reduction in port dues will be granted to ocean-going vessels that use approved abatement/scrubber technology or burn clean fuels during the entire port stay (5 days or less). The 3R Fund by NEA is a co-funding scheme to encourage organisations to implement waste minimisation and recycling projects. Funding is provided up to 80% of the qualifying costs and subject to a cap of $1 million per project or per applicant, and depends on the quantity and type of waste reduced or recycled. The minimum tonnage eligibility is 100 tons reduced, reused or recycled over the whole project duration. The maximum project duration is 3.5 years. The 3R Fund is open for application from 1-31 May and 1-30 Nov. The Environment Technology Research Programme (ETRP) is a $21 million seed funding programme by NEA to build up technological competencies and support companies and researchers in waste management research. The ETRP awards grants to R&D projects on waste management such as energy recovery, materials recovery and special waste treatment, and is open to researchers from Institutes of Higher Learning (IHLs), public sector agencies, for-profit and not-for-profit research organisations, and Singapore-registered companies. The maximum funding for each project is up to $2 million and for a maximum of 3 years. The 3P Partnership Fund by NEA aims to encourage organisations, companies and individuals from the People, Private and Public (3P) sectors to work together to develop environmental initiatives and promote environmental ownership. First-time applicants would receive no more than 50% of the eligible costs. The Call for Ideas Fund (CIF) by NEA provides co-funding for projects that solve environmental problems in the community, and the development of mobile applications which enable access to environmental information. A maximum of $20,000 or 80% of the total project cost for supportable cost items (whichever is lower) will be supported. The HDB Greenprint Fund will fund and support the test-bedding of smart and sustainable solutions and implementations within the pilot neighbourhood in Yuhua, subject to a cap of S$100,000 per application. The Capability Development Grant (CDG) by SPRING Singapore funds SMEs up to 70% of qualifying project costs such as consultancy, training, certification and equipment costs. The adoption of these certifications and standards qualify for CDG funding: FSC Chain of Custody and/or PEFC Chain of Custody; GREENGUARD Certification; ISO 50001 Certification on Energy Management Systems; ISO 14064 Certification on Greenhouse Gas Management; SS 577 Certification on Water Efficiency Management Systems; and SS 587 End-of-Life ICT Management Systems. The CDG can be used for energy efficiency project implementation or energy efficiency thought leadership under the SME Energy Efficiency Initiative, which is developed by SPRING Singapore and led by the Sustainable Energy Association of Singapore (SEAS). The CDG can also be used to strengthen technology innovation capabilities through the help of Centres of Innovation (COIs), such as the Environmental and Water Technology Centre of Innovation at Ngee Ann Polytechnic. The Innovation & Capability Voucher (ICV) by SPRING Singapore is a $5,000-value voucher for SMEs to upgrade and strengthen their core business operations through consultancy in the areas of innovation, productivity, human resources and financial management. The ICV can be used for consultancy for implementation of ISO 14001, OHSAS 18001, and energy efficiency audits. I am in the process of developing a system toilet which are with integerate system ,i.e easy installation(DIY) ,water saving and used of energy from water . Could you plse advise whom should I approach for seeking for grants in developing such products ? I have approach Spring Singapore and was rejected commenting that such product are not highly upstream and not novel enough. Could you plse elighten me . Dear sir ,i would like to know is there any funding or grant for a person to build a prototype of their invention. Please reply to us and we will be interested to know more about your innovation. That is Amr Youssef, A business man licensed in Dubai free zone and USA. Master and current PhD in petroleum engineering and Geo Earth sciences. Wish you the good luck in your business. I only know PIC, ICV, CDG. CDG is the most popular grant for SME, it really help company a lot when they want to upgrade the productivity. I have invented a completely revolutionary device (and additional spin off variations) that reduces the normal 568 liters of water used during the average shower to .02 liters. Prototypes have been used in a closed testing environment for more than 5 years performing perfectly with no negative issues. The device is 100% green. The device is very inexpensive to produce and will therefore have a very low (less than $10 U.S.D.) Consumer cost. The device is durable and should last almost indefinitely. The device is pocket sized, portable, and suitable for home, commercial, military, humanitarian, military and other uses just to name a few. I am now ready to move forward commercialization of the device for sale at government level for distribution for military, humanitarian, commercial, and residential use. I believe that this device qualifies for more than a dozen of the programs listed above and would welcome a discussion if Singapore would be interested in pioneering this technology with me.